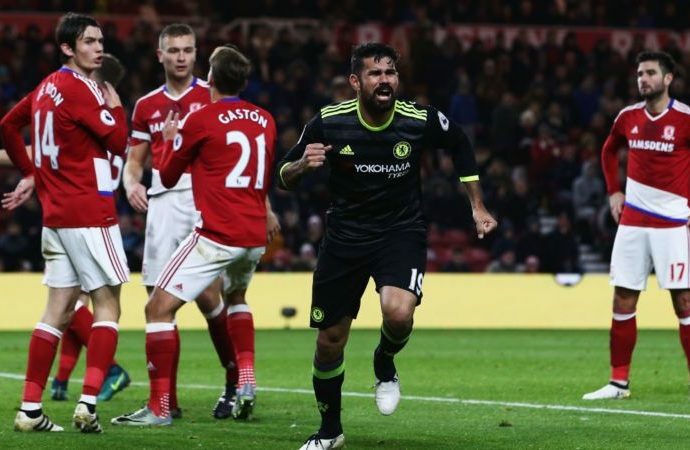 Chelsea made it six consecutive victories and six clean sheets in the Premier League as they beat Middlesbrough 1-0 to move to the top of the table. Diego Costa scored the only goal of the game his 10th of the season to hand the Blues the victory, which takes them one point ahead of Liverpool and Manchester City at the division’s summit. The opening stages of the first half at the Riverside Stadium were an even affair with both teams looking to get forward but lacking in the final third Alvaro Negredo up one end, and Victor Moses down the other, finding space for strikes but missing the target. Chelsea, however, upped their game at the midway point of the first period, with one well-worked move seeing Eden Hazard on his 150th Premier League appearance pick out the run of Moses, who then fed the ball across to Pedro, but Victor Valdes was able to turn the Spaniard’s strike over the bar with an excellent save. The Blues continued to attack as the half wore on but Valdes was again on hand to thwart them smothering a Pedro cross with Hazard waiting to pounce before getting down low to stop a Marcos Alonso strike. A rare chance fell Middlesbrough’s way after 36 minutes but Negredo could only head wide after arriving to meet an Antonio Barragan delivery. Chelsea found the breakthrough five minutes later, though, when Costa took advantage of some poor Boro defending from a Hazard corner to fire home from close range and become the first player this season to reach 10 Premier League goals. The visitors started the second half with plenty of intent and nearly grabbed a second just a minute after the restart, but Valdes again pulled off a good stop, this time denying a low strike from Alonso before Calum Chambers then cleared the danger. A good chance soon fell Middlesbrough’s way as they played the ball around nicely, but Gaston Ramirez failed to even hit the target with his effort from the edge of the area. The hosts looked to have found some renewed confidence in their play but Chelsea were soon back on top and almost doubled their lead on 63 minutes with a wonderful move David Luiz picked out Costa, who headed the ball into the path of Pedro, but the Spaniard’s first-time strike rattled against the crossbar. Just a minute later and Chelsea breached Middlesbrough’s defence once again with Costa slipping in Moses, but he could only fire over from close range. Boro pushed for an equaliser as time ticked away, with Negredo seeing a volley well saved by Thibaut Courtois, but they were unable to find a breakthrough leaving them just a point above the relegation zone.